Many businesses with an online presence now understand the need for implementing an SEO strategy. But search engine optimisation is a broad area of activity, and many specialist tactics and strategies are used by SEO companies. It can be confusing or difficult to manage SEO campaigns without breaking things down into logical categories. Generally speaking, SEO activity can be broken down into two broad categories: on-site SEO and off-site SEO. On-site SEO refers to everything you can do on your website to improve its SEO and therefore, its Google ranking. In order for a website or web page to be considered deserving of a higher search engine ranking, it has to tick a number of boxes, some of which are quite complicated for the inexperienced (not in the least because Google changes its algorithms with regularity). On-site SEO practices include Google friendly code and layouts, meta-descriptions, title tags, SEF (Search Engine Friendly) URLs and so on. Check out our On-Site SEO checklist for more details. Where you can assist in your website’s on-site SEO is in the practice of adding new content, relevant to the targeted keywords, and adding internal links within the site itself. Keep your keywords in mind when writing website content for search engine ranking, but make sure that your text is still appealing to real readers with correct spelling and grammar, as well as a compelling narrative. A great example is writing a blog post about a topic relevant to your product or service. This additional website content will contribute to your website authority. Including a link to the relevant product or service page improves your product pages authority on the subject. But avoid ‘click here’ links – use anchor text that is meaningful and keyword rich. If you have a WordPress website, with little effort you can also boost your on-site SEO by including your keywords in meta descriptions, in <h1-6> heading tags, and in image tags. Read these 9 ways to SEO your blog posts. 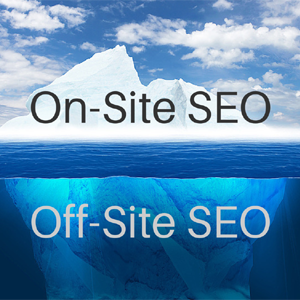 So What is Off-Site SEO? Everything that happens on the Internet away from your business website that links back to your website affects off-site SEO. What you need here are effective back-links from other websites and blogs. Each link from an external website to your site passes an amount of “link juice” acting like a vote for your website authority. As the amount of external references to your business website grows, more and more “link juice” is passed to your website, and in turn, you achieve increased prominence in search engine results. It is important to keep in mind that all backlinks are not valued in the same way. In order for your off-site SEO to be successful, you need to follow the golden rules of link building to ensure backlinks are from quality websites, relevant to your keywords and theme. If you expect your SEO to be boosted by posting an article to hundreds of directories, you might not see any results. In fact, you could damage your rankings or even attract a Google penalty. DIY Off-site SEO can be quite hit and miss. This is because there are many factors which influence the value of a backlink. Essential DIY Off-site SEO is making sure you focus on one way back links, from pages with readable well written content. Reciprocal linking, or link exchanges, are the practice of linking to a site for a back-link to your site. These are less effective than one way back-links, and can even be damaging if linking to sites that could be considered poor quality, or engaging in link schemes detected by Google. It is a great idea to engage in some DIY SEO practices, but only by hiring professionals who know the ever-changing world of SEO inside out will you be able to really optimise your organic traffic and know you are making effective use of your time. At SEO Copilot, we have the tools, experience, and knowledge base that can help you to get your SEO on track and give you an important competitive advantage. An advantage of our SEO packages is the support for DIY SEO. We love to educate and assist clients with their own SEO efforts, after all working closely together means even better results.